Pony Expresso Coffee Shop, located at 5182 Highway 49 - just past the 4 way stop. FREE internet surfing to everyone. 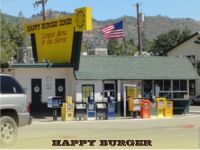 Happy Burger Diner, located at the corner of Highway 140 and 12th Streets. Free surfing to Sierra Tel Internet (STI) subscribers only. Non-STI subscribers must pay $2.95 per hour, $7.95 per day, $14.95 per week, or $24.95 per month. Both hot spots are Wi-Fi and 802.11b compliant.